The formulation "Lagos is not catching up with [Europe]. Rather, [Europe] may be catching up with Lagos" has been much quoted in African (urban) studies (e.g. Comaroff and Comaroff 14; Enwezor 116; Nuttall and Mbembe 4; Rao 676). The frequency of citation indexes what AbdouMaliq Simone describes as "a burgeoning interest [...] as to what the apparent ungovernability, yet ongoing survival, of cities like Lagos or Kinshasa may have to say about the future of urban governance in general" (Simone 2). Yet paradoxically, the citations are taken from a book that does not exist. Lagos: How it Works has never been published (Probst 140). Announced for 2007, the book has been awaiting publication for almost a decade now.1 It is as if the complexity of the ever-changing megalopolis of Lagos defies any form of summing-up or definition, particularly from a standpoint located outside of Africa, so much so that Koolhaas' descriptive project must be perpetually deferred. Working out exactly how Lagos works, a definition of a metropolis always ahead of itself, renders the book of the city publishable only on the cusp of a permanently receding temporal horizon. Significantly, Nuttall and Mbembe reference an "unpublished draft" (Nuttall and Mbembe, eds 365), the "draft" suggesting that though the book seeks to get ahead of reality like something that comes from the draughtsman's table, in fact, as the "unpublished" implies, the city is in advance of any future projections. The city is the future itself, embodied in the eponymous "elusive" ephemerality that Nuttall and Mbembe ascribe to the constant transformations of the African megalopolis (Nuttall and Mbembe, eds). For an urban critic such as Marshall Berman, this extreme fungibility and stability is precisely that which defines modernity (Berman 90-114), thus making Africa, as Koolhaas suggests, the epitome of global futurity. If this is in fact the case, then Pliny the elder's quip that "semper aliquid novi Africam adferre" ("Africa is always producing some novelty") (Pliny III, 32, 33), would appear to be vindicated. Whether, however, this is a cause for celebration is hard to say. Famously, V. S. Naipaul saw the transformations of postcolonial Africa, not as progress, but as its exact opposite: Africa for him was "a place where the future had come and gone" (Naipaul 30). Naipaul's racism, conservatism and catastrophism are rebarbative, but his extremism may serve as a useful foil for enquiring about visions of the future in contemporary Africa, at a moment which sees the various societies of the continent undergoing social, economic and political transformations whose magnitude can probably only be compared with the irruption of European colonization. Perspectives on the future of the continent range from perplexity via 'Afropessimism" (Diop 84, Zeleza 2) to (often cautious) optimism. Other "impeded futures" (Bloch 33) are the result of the toll of AIDS or high levels of unemployment among large sectors of the population across various Africans countries. One possible function of literary creation may be to provide a bulwark against such pessimism. Literary texts, even though they are often narrated in the past tense, create virtual universes which, by virtue of their metonymic, indeed "heterotopic" nature (Foucault, Essential Works 178-84), gesture towards possible "heterochronic" futures (Rancière 34). Thus, they may be capable of suggesting, if not utopias, at least alternative worlds (Pavel) or "adjacent futures" (Brown in this volume), which would unlock the repetition-compulsion of trauma or the closed doors of despair and apathy. Surprisingly, however, some African fiction appears to eschew such a role. In the domain of contemporary literature, Medalie's recent reading of relationships between the past and the present in Coetzee's Disgrace, Mda's Heart of Redness and van Niekerks Agaat concludes thus: "These novels show that, having once summoned the past, it is extraordinarily difficult to set it aside, to divest it of its atavistic elements, or to reconcile and integrate it with the present in a meaningful continuum" (Medalie 15)-not to mention the future, which appears to be radically eclipsed in Medalie's pessimistic synthesis of past and present.2 Such bleakness is reflected in a number of contemporary African texts. In Slingsby's The Joining (1996) the children of the immediate post-apartheid moment decide to stay in an idealized San past; a decade later, in Gordimer's No Time Like the Present (2012), her ex-Struggle protagonist couple resolve to leave South Africa for Australia. Here the past as a dialectic is not completed (Bloch 33): "The Struggle's not over" (Gordimer, No Time 64). Nor, however, can the future be born. In such texts, African futures are simply foreclosed (compare Bakhtin 146-48). Much in the pessimism of these texts may be a residue of Modernist individual alienation, transported into an African literary context by the first generation of Euro-language novelists (see Gikandi 9-10), and then projected onto alienated postcolonial temporalities. Yet the past is not perceived always as devouring the future. Literature is often credited with the capacity to return to the past precisely in order to leave it behind and, in so doing, usher in the future. Sarah Nuttall acknowledges the continent's persistent "structures of deep racism and violence that are a part of all [its] histories", countering this with the conviction that the "investigation of such complex and contradictory formations may be the only way to write [...] Africa out of a past and into a future, while always remaining mindful of what is actually happening" (Nuttall 748). Similarly, Eileen Julien notes, "I know of no African novels that erase the history of colonialism and the repression of contemporary regimes. On the contrary [...] the past is written though the lens of a projected future, so as to open up possibilities for it" (Julien 668). Outside the realm of the creative arts, such a task appears, if one is to believe the rhetoric, to be less fraught with difficulties. In the so-called "real world" of business, voices of optimism are everywhere. At the top end of Africa's socio-economic hierarchies, the advocates of the free market frequently strike an upbeat tone (for an ongoing sample, see the website Good News from Africa). One pair of analysts claim that, "[a]t this point, one of Africa's biggest enemies is its image [...] as a basket case of corruption, drought and conflict [.] But with the present level of growth and the scale of return that investors are getting on their money, this 'hidden' Africa may not be a secret much longer" (Kamau and Brown 80). Similary upbeat prognoses such as Radelet's Emerging Africa, which elaborates an optimistic vision for the 17 fastest-growing economies in Africa, note that the prospects for growth for southern Africa hinge however on South Africa's economic situation (Radelet)-which, if we are to believe the plummeting rand, the drop in gold production and shrinking volume of insurance activity, makes for a less rosy picture of the middle-term future for sub-Saharan Africa. More cautiously optimistic appraisals of African futures are contained in the subtitles of Robert Rotberg's 2013 book on the "Consummate Challenges, Abundant Opportunities" of African futures (Rotberg) or of Luc Sindjoun's 2010 collection, which more soberly detects a "dialectics of opportunities and constraints" (Sindjoun, ed), and speaks explicitly of "debates around development visions" (Sindjoun, ed. 4). Previous exercises in prediction, exemplifying "the future as history" (Saul and Bond, part 3) or "future inheritances" (Plaatjies, ed. ), such as Bertil Odén's judicious 1996 prognosis of a mix of state-sponsored and spontaneous, unregulated processes of development in post-apartheid South Africa and its neighbours (noting on the way the danger of the emergence of enclaves of wealth within a broader context of ongoing poverty), have transpired to be fairly accurate. These are top-down perspectives. From the grassroots point of view, a resilient optimism can also be detected. "Resilience" has become a central term within the conceptualization which has followed upon the rise of trauma theory since the 1990s; it refers to the ways in which subjects who have suffered traumatic experiences, whether individual or collective, survive and go on, making do in a surprisingly positive manner (Luckhurst 210-13). Resilient optimism thus describes a pragmatic, makeshift mode of futurity that eludes the perils of utopianism. Back in 1981, Nadine Gordimer imagined a future devolution of power in South Africa epitomized by a white couple's relinquishment of the bakkie to their erstwhile domestic servant July: "There was a moment to ask for the him for the keys. But it was let pass" (Gordimer, July's People 57). The image of learning to drive offers a remarkably prescient figure for haphazard progress of coming democratization: "They stood in the midday sun and watched [...] the yellow bakkie being reversed, bucking forward, leaping suddenly backwards again; kicking to a stop. July was at the wheel. His friend was teaching him to drive" (Gordimer, July's People 57). Given the ideological freight carried by the automobile as juggernaut of modernity, Gordimer's conceit neatly encapsulates the turbulent redistribution of resources and power under a future regime of democratization, still barely imaginable at the time Gordimer wrote, but in fact hardly more than a decade distant-and now the everyday future-in-the-making in many parts of Africa. At an even more prosaic level, Michael Titlestad focuses on another vehicle, the makeshift trolleys of South Africa's informal urban recyclers. Titlestad describes the recyclers' plodding daily trajectory, their paths across the cities that allow them to eke out a meagre subsistence from the detritus of African modernity (Titlestad, "The Logic of the Apocalypse: A Clerical Rejoinder" 104-09). Their activity exemplifies the everyday process of converting that which has no use into something which will be reworked for future utilization. To the extent that they are engaged, literally and materially, in the "challenges of crafting a future" (Titlestad, "Foreword" xi), they confirm Lukács' sense that "the tendencies leading to the future are in fact more firmly and definitely contained in what really is than in the most beautiful Utopian dreams of projections" (Lukács 421). Titlestad's recyclers also offer a riposte to Benjamin's angel of history (Benjamin 24): they do not look backwards at the rubble piling up behind them, but rather forwards, towing behind them the rubbish they have piled precariously on their makeshift trolleys. Rather than the endemic catastrophism that Titlestad's piece in this issue addresses, the image of recycling proposes an ongoing, if fitful process of making-the-future-out-of-what-the-present-offers. It is a form of future-oriented living in which, to cite Stefan Helgesson, "life goes on in a pragmatic, patchwork fashion" (Helgesson in Moses et.al. 174). Such models of this form of temporal "bricolage"' (compare Lévi-Strauss 16-33) eschew the teleologies of Euromodernity whose nightmarish reverse is revealed in catastrophism. Both of these options-elite literary pessimism and popular literary-cultural optimism-and a range of more nuanced positions between them are the subject of this themed issue of the Tydskrif vir Letterkunde. While Nuttall's work typifies cultural studies' interest in "the fictions with which people fill the future" in the broadest possible sense, literary scholars may be interested in "fictions" in a narrower, more immediately textual sense. Nonetheless, if we are faithful to the "synecdochic" workings of literature as such (the tale as framed excerpt or episode stands in for the breadth of history) then such formal narrative "fictions" will exert some influence, however minimal their power of contagion may be, on the vernacular "fictions with which people fill the future". It seems that our task as scholars working in the humanities in Africa, or linked to the humanities in Africa, is not so much to provide, as Foucault once quipped, "a history of the present" (Foucault, Discipline and Punish 31), but rather, to map out "histories (in all the senses of the word) of the future". Such work would be a form of recycling, creative, even disrespectful recycling by those whose business is to re-read texts. Rather, the narrative recycling I imagine would be an open-ended, performative process without precedents, a recycling that would not deflate into mode-retro but which would transform the material it reworked, the creation of the future out of the now. An apposite image from the realm of the creative arts might be the at times haunting, at times comical, at times almost grotesque sculptures emerging from the Transforming Arms into Plowshares/Transformagäo de Armas em Enxadas (TAE) project in Mozambique. These remarkable creations area soldered together out of the rusting remains of Kalashni-kovs, ammunition magazines, rocket launchers, or shell cartridges to make figures or objects from everyday life. 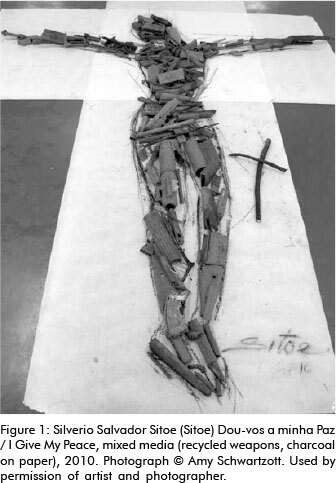 Some of these sculptures are not welded but merely loosely assembled (see figure 1), thus revealing "an ability to recycle the weapons over and over" (Schwartz-ott 105). Such work is emblematic of an imaginative usage of the war-torn past to craft images of a future polity subject to ongoing creative transformation. The articles in this thematic number embark upon similar enterprises in their analyses of contemporary fictions. They highlight such projects for, and projections of the future, by parsing possible African future tenses, and by setting up typologies of modes and moods of futurity on the continent. Joan-Mari Barendse analyses a range of Afrikaans novels published after 2000, showing how their dystopian visions of a future South Africa reflect the anxieties of Afrikaner masculinity. Molly Brown's selection of young-adult/cross-over fiction, including Bregin's The Slayer of Shadows (1996), Lauren Beukes' Zoo City (2010) and Lily Herne's Deadlands (2012), presents urban dystopias which project possible future imaginations for tomorrow's adults, with varying degrees of optimist and pessimism, simplification and critical complexity. (Other South African exemplars of this sci-fi genre, sometimes with cyber overtones, might include Lauren Beukes' Moxyland , Henrietta Rose-Innes's Nineveh , or Zinaid Meeran's Tanuki Ichiban .) Michael Gromov offers a panorama of dystopian experimental Swahili novels from the 1990s onwards that issue a collective warning about the long-term consequences of the neo-colonial order; here the threat to the future is one quite different to that identified by Barendse's selection, for example. (Similar exemplars, such as Egyptian Ahmed Khaled Towfik's antonymically entitled Utopia [2008, English. trans. 2011], could be noted elsewhere on the continent). Michael Titlestad provides a broader-based and longer genealogy for such cata-strophism, showing that, at least in the South African context, it has always been instrumentalized by populist politicians to mobilize dominant-class fears against the majority populace (see also Titlestad, "Foreword" 188-89). He suggests instead a more pragmatist approach to politics on the African continent, one which eschews "grand narratives" to focus on the grassroots processes of local transformation, one where "the actual struggle we have to engage in is to find a unifying purpose in a world of complexity and difference" (Titlestad, "Foreword" 189). Exemplifying this scepticism, Solomon Azumurana casts a retrospective glance upon Soyinka's 1960 warnings about a post-independence future in which a comprador elite proved his dire predications all too accurate. Rodwell Makombe reads Zimbabwean Mashingaidze Gomo's A Fine Madness (2010) to decline the elements of such grand narratives, noting the perils involved in such paradigms for the future. Similarly, Bill Ashcroft analyses South Africa's Constitutional Court in Johannesburg, an icon of democratic transformation built on the site of one of the apartheid era's most notorious prisons; he detects in the site's architectural idiom fraught tensions between its motivating impulses of state ideology and liberation utopianism, an entanglement in many ways indicative of the future trajectories of the post-apartheid polity. In contrast to literary producers and their works imagined as "mirrors of the gigantic shadows which futurity casts upon the present" (Shelley 701), we might turn to the more humble "micro-narratives" of " 'small' li[ves]" espoused by Titlestad's work (Titlestad, 'Foreword" xi). Such "minor" narratives are explored in my piece on Véronique Tadjo's semi-documentary novel on post-genocide Rwanda. Her text exemplifies such an emphasis upon the micro-details of everyday life, indeed upon the dynamic of life itself, in constructing a vision for the future. Similarly, Gail Fincham's article on van Niekerk's Agaat (2004; Engl. trans. 2006) shows how the traditionally minor, feminine arts of sewing, embroidery and stitching become the privileged site of a future-bearing reconciliation between the warring constituencies of South Africa. Alina Rinkanya continues this train of thought in her historical overview of contemporary Kenyan women's writing and its attendant optimism, ranging from Rebecca Njau, via Margaret Ogola, through to Monica Genya. (Other more recent examples of such narratives from around the continent might be Léonora Miano's Contours du jour qui vient  or Nathalie Etoke's Je vois du soleil dans tes yeux .) The continuing relevance of such "minor arts" is explored by Amy Schwartzott's piece, which charts the continuing project of weapons recycling in Mozambique (TAE) as, as decade after the post-independence wars, civil war once again becomes a threat to ordinary peoples' futures. Her piece does not merely discuss these instances of "recyclia", but also includes excerpts from the artists' own "micro-narratives". These "small narratives" nestle in the interstices of the mega-stories that dominate our times. They redeem what Bloch once called "non-synchronicity", namely the sense that "[n]ot all people exist in the same Now. [...] One has one's times according to where one stands corporeally, above all in terms of classes" (Bloch 22). This jagged contradiction of different timescales, in particular between temporalities of change and temporalities of retrogression or conservatism, is perceived by Bloch as an opportunity. He sees in the "dialectic" of non-synchronous temporalities a potential "liberation [...] of the still possible future from the past [...] by putting both in the present" (Bloch 33; emphasis in original). Bloch's own epoch saw the triumph of a retrogressive, atavistic fascism and the brutal annihilation of other "minor" temporalities. Nonetheless, in the disjunction of many temporalities-what Mbembe describes as "multiple durées made up of discontinuities, reversals, inertias, and swings that overlay one another, interpenetrate one another, and envelope one another: an entanglement" (Mbembe, On the Postcolony 14)-there lies the possibility of making the future. In his work on non-African syntheses of a putative African philosophy (compare Hountondji 39-50), Mudimbe rejects an "invented Africa" whose concepts continue to be made-in-Europe (Mudimbe xi; emphasis in original). Instead, he advocates an articulation of African self-knowledge founded on "the experience of rejected forms of wisdom which are not part of the structures of political power and scientific knowledge" (Mudimbe x-xi). Mudimbe is primarily interested here in what appear to be traditionalist, past-oriented philosophies. But his suggestions can be turned around and made to face forwards towards the future. By analogy, transformed futures would also be made out of rejected, marginal, "minor" temporalities, typically those that are encoded within literary fictions. Such fictions and their future would allow us "to look beyond the futures imagined for us so that we may interrogate them with the full weight of a history informed with an ever-reflexive utopianism" (Green 272). Such fictions elude capture by ready-mades or by resignation, and would embark upon the resilient business of cultural "reinvention". Teju Coles invokes the exemplary work of "a small but tenacious breed of Nigerian cultural innovators": "They are emerging, these creatives, in spite of everything; and they are essential because they are signs of hope in a place that, like all other places on the limited earth, needs hope" (Cole 130, 131). Hope, creativity, reinvention: of such hopeful, creative, literary "reinventions" of African futures the articles that follow present a variegated and provocative selection. I would like to thank my colleagues at the University of Pretoria, Andries Visagie and Willie Burger for co-convening the conference in July 2013 out of which this journal issue arose. A words of thanks is also due to all those people, some of whom are represented in this journal number, who participated in the conference by presenting papers or participating in the lively discussion that resulted. I wish to acknowledge the financial support provide by the Faculty of Humanities at UP and the Andrew W. Mellon Foundation in New York, which made the conference possible. Thanks are due to all the members of the Mellon-funded "Southern Modernities" project for their involvement. I am also grateful to colleagues in the English Department at UP for their support, and again to Willie Burger for scooting up to Constitution Hill to take photos in a gap between rain showers and research leave. Matthias-Philipp Schmerold's eagle-eye for formatting and bibliography was of great assistance. Finally I wish to acknowledge Tatjana Pavlov-West's assistance in drawing my attention to some of her visual studies research material. Good News from Africa. <http://www.goodnewsaboutafrica.com/> [ Links ]. Little, Ben, ed. Radical Future: Politics for the Next Generation. London: Lawrence and Wishart/Soundings/ Compass Youth/Media Department at Middlesex University, 2010. Accessible as an eBook at: <http://www.lwbooks.co.uVebooks/Radical%20Future%20(Final%202).pdf> [ Links ]. Zeleza, Paul Tiyambe. "Introduction: The Causes and Costs of War in Africa: From Liberation Struggles to the 'War on Terror.'" The Roots of African Conflicts: The Causes and Costs. Eds. Paul Tiyambe Zeleza and Alfred G. Nhema. Oxford: James Currey, 2008. 1-35. 1 Koolhaas and Cleijne's Lagos: How It Works is variously listed in electronic catalogues with the ISBN numbers 978-3-03778-085-5 and 3-03778-085-1 (edition announced as published by Birkhäuser [no place], 2007) or 3-03-778085-1 (edition announced as published by Lars Müller [Baden] and Springer [London], 2007). But the book does not exist and cannot be consulted or borrowed. 2 It is striking, however, that little of this pessimism is to be found in Medalie's 2006 novel The Shadow Follows. Despite the title, which resonates with the persistent past lamented in Medalie's analysis of Coetzee, Mda and van Niekerk, the novel embraces a humble futurity of small everyday gestures. Its opening lines wryly scramble the "sequence of grief" (1), and its closing episode comments upon the gradual, as-yet-incomplete revelation of "the shape of hope" in the work of art (243). 3 In a typical gesture of authorial self-mockery, Ivan Vladislavic's The Restless Supermarket (2006) includes the figure of Dan Boguslavic, a dealer in "Apartheid memorabilia. Import/export. [...] Ostrich eggs with paintings on them: Sharpeville massacre. District six, forced removals. Student uprising, 1976. Stephen Bantu Biko. [...] It didn't end with eggs, either. There were all sorts of things for sale. Benches, whites only. Easy to assemble. Blankets, prison, grey. [...] 'People will hardly be interested in all this old junk'-'Wakey-wakey, Aubrey. Is same in Germany now. Uniforms and hats is coming very strong. [...] Major turnover is rubble' " (280). Boguslavicc's name is a play on "day of godly fame" with echoes of the verb "to become rich".